Have you ever heard the statistic that watermelons are made up of 92% water? Well these watermelons are made up of 100% luxurious soap and mouthwatering watermelon fragrance oil. Put these juicy soaps on the edge of your sink for some extra cute flare. OR buy all of the ingredients you need just by clicking on the “Buy It Now” icon below. Note: The liquid red and Half Round Log Mold have been discontinued. They have been replaced with the Perfect Red Color Block and Silicone Loaf Mold. 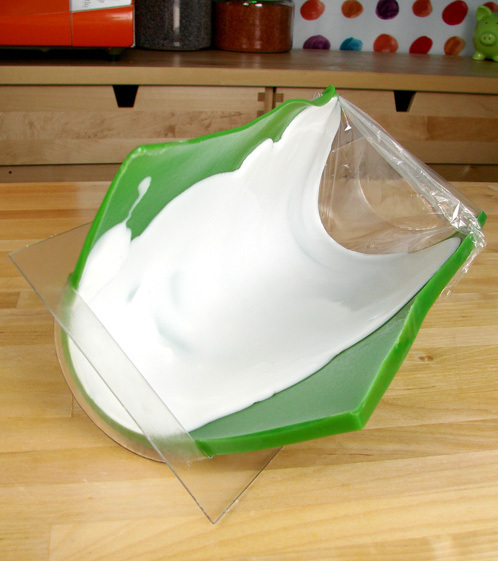 The Silicone Loaf Mold is flexible, so you may need to prop it up with something! 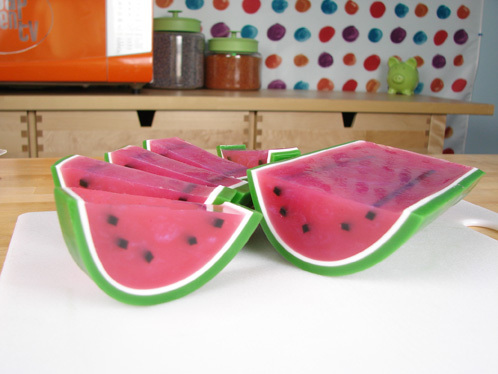 ONE: Prep the watermelon “seeds” by melting 2 ounces of clear soap base and mixing in a couple drops of liquid black. 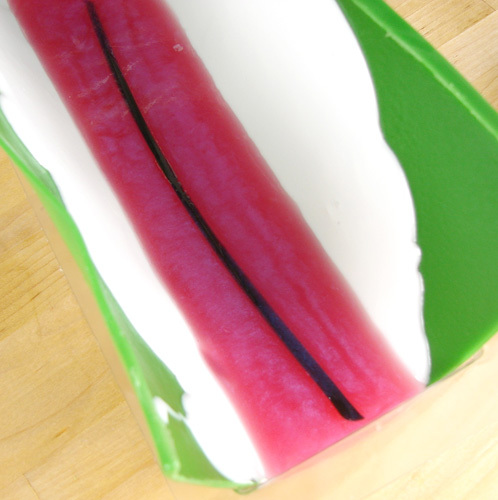 Pour the soap into one side of the glossy tray mold and let cool. 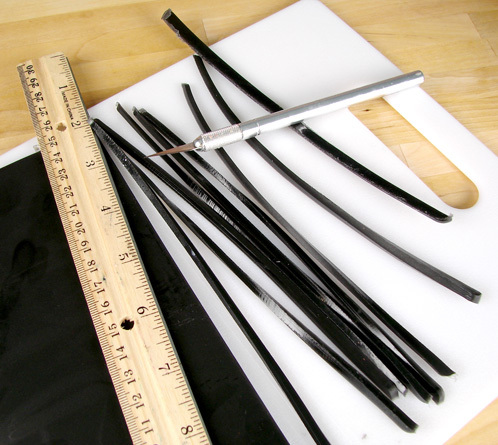 Once the soap has cooled, release the soap from the mold and use a ruler and an craft knife to cut thin strips of black. You’ll need five long slivers. TWO: Now it’s time to make the “rind.” Melt 7 ounce of clear soap base and mix in .7 ounces of liquid glycerin and 6-7 drops of liquid green colorant. Mix well and pour the soap into the tray mold. Spritz with rubbing alcohol to eliminate air bubbles. Let cool. Hint: The liquid glycerin adds some pliability to the soap so we can bend it with out breaking. 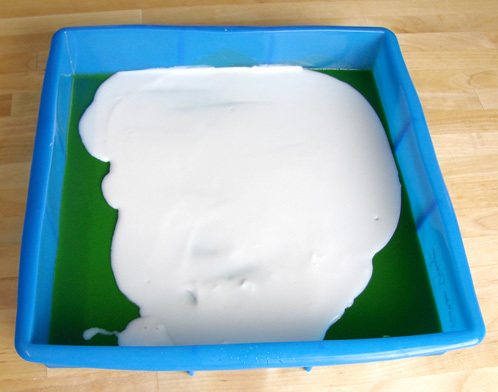 THREE: For the white layer of the rind, melt 3 ounces of white soap base and mix in .3 ounces of liquid glycerin. Let the white soap cool to 125-130 degrees, spritz the cooled green layer of soap and pour the white soap down the middle of your mold. Tip: I wanted the white section of the rind to be super thin. Three ounces of soap isn’t quite enough to cover the entire bottom of the mold so make sure you pour the soap down the middle of the mold. It’s ok if the sides are not covered in white. FOUR: It’s show time. Release the green and white soap from the mold, bend it down the middle and place it into the half round log mold. Make sure that the white soap is even on both sides. Scoot the soap to one end of the mold and press it down firmly. Seal the other end with plastic wrap. You can wrap some of the plastic underneath the soap if needed. Tip: See how my mold is tipping a little bit? You’ll need to find something to prop up the mold. I used two small matching bowls. FIVE: To make the sweet, inside of the watermelon, melt 12 ounces of clear soap base and mix in .5 ounces of watermelon fragrance oil. For the fantastic pink color, I combined shavings of the Perfect Red Color Block with red blue mica. Mix well and let the soap cool to about 130 degrees and have some plastic wrap on hand to cover the soap to keep it warm between pours. SIX: Spritz 1 long black sliver of soap and the white soap layer in the mold. Then pour about 1/3 of the pink soap. Place the long black strip of soap into the wet soap. Spritz with rubbing alcohol to get rid of any air bubbles. Then cover the remaining pink soap with plastic wrap to keep it warm. Let this layer cool for about three minutes and repeat this step two more times. On the second pour add two of the black slivers (one on each side of the original) and on the third pour add the last two black slivers (again on the outsides of the previous pour). 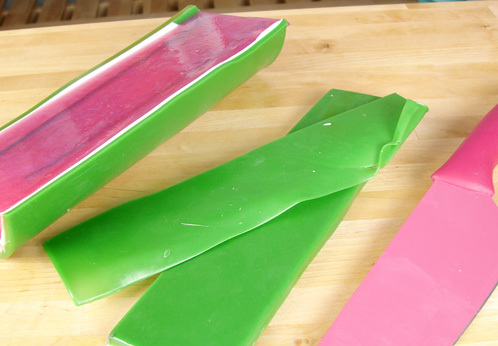 SEVEN: Once the juicy soap has cooled, unmold the soap and carefully slice off the long, green edges with a knife (and put it in your scrap soap bin). Then slice the watermelon in to guest size wedges. This recipe is great and quite forgiving (or tolerant to improvisation). I am on a limited budget and tried to find ways to use what I had on hand instead of buying them. To my surprise it all worked. I used parchment paper (had foil on the other side, apparently new on the market?) as the square tray by taping the sides up. I used a bread crumb canister with a portion cut out to act as the semi-circular mold. A bonus was that I used the lid (with a portion cut off) to seal the end of the “mold” so nothing leaked out. Lastly I did not have black coloring so I mixed equal parts of the primary colors and to my surprise I came out with black. I made the seed strips in the same parchment paper mold. I am so happy this all worked and so is my soon to be 4 year-old daughter. They are going to be party favors for her party. I have never made M & P soap before and if they came out this nicely for me with all my contraptions, I would anyone can do it. Can’t wait to take a nice look at Bramble Berry for the quality goods! P.S. Your daughters party is going to rock with this amazing soap! This is amazing! Could you please please please do a video of this?! Cute idea for a shower gift! It’s going to be a hit! My batch made about 10 (depending on how thick you cut the slices). So if you need 70 total, I would recommend about 10 lbs of clear soap base, 2 lbs of white soap base and at least 24 ounces of the fragrance oil (and maybe a little extra of each just in case). The colors should totally last you 7 batches if you hit the “buy it now” icon. Let me know how they turn out! I would love to see pictures! How many soaps would this make approximately? I am planning a baby shower for my sister this summer and would love to do little soaps as party favors. We are thinking there will be around 70 people in attendance. How much stuff would I need to buy? Did anyone else have trouble with the green & white parts of the rind separating? When I started to slice off pieces of melon, the green rind just popped right off! 🙁 Did I use too much white? Not enough alcohol spritzed on? absolutely amazing. i love the look of this, and will feature you on our blog, finecraftguild.com, over the next few weeks. Fantastic hint! I LOVE IT! Thank you for sharing…. Beautifully done 🙂 Here’s a tip for the seeds: Take a milkshake straw and pinch down one side to make the seed shape. Close off one end either with plastic wrap or by melting a small amount of mp in a container and standing the end of the straw in it to set up and seal. Fill the straw with black soap. To unmold, simply slice down the side of the straw with an exacto blade remove the seed strip, slice and you have perfectly shaped seeds for your loaves. And you’re not even smelling the soaps; they smell so jolly rancher good…. I’ve used rice in the past as well. It is awesome for sure. But for some reason, I don’t have any on hand (scratching head). I’m betting I threw it out in a cleaning frenzy, thinking to myself “Why would I have rice here! ?” LOL! I’m glad we could help. Yay! I hope you have lots of success with your first batch of it. I LOVE the idea of your Lime Mojito soap. I am totally going to play with that idea and do the blueberry seeds. The peppermint leaves probably go brown right? I just saw a really neat idea on our FB page; someone did real dried seeds and they looked adorable in the watermelon soap too. Make sure to have the soap in the shade. Reds are really prone to bleaching out in the sun. =) But yes, perfect for Farmer’s Markets for sure. 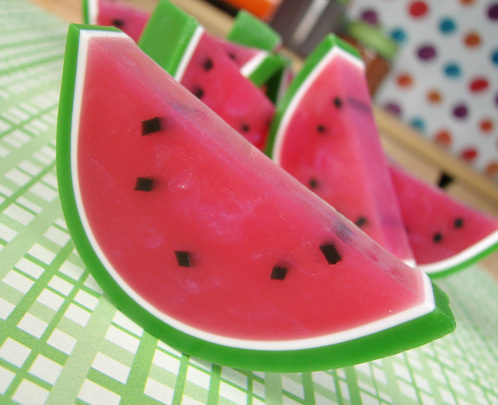 The bendy soap really helps to make the watermelon rind perfect. If you’re in a super humid area, it does add a bit to the humidity/sweating issue so keep that in mind. These are so fun!!! I was just thinking about trying to re-create my CP version again next week. Que maravilla ! Es Impresionante , ha quedado precioso . Muchas gracias Por la explicaciones . Un saludo . A great tutorial Anne Marie, and as always explain what you do very well and easy. I liked it. Thank you. mmmm!!! Deliciuos!!!!! Can I have a one???? my friend and I did this last summer, but in a more complicated way… we suspended an other half loaf mold about 1/4 inch above our ‘base mold’ and poured in the green and then lifted it after 10ish minutes and put it about 1/8 in above the green and poured in a perlescent white(i forget which mica we used) and after another 10ish minutes we did the pink and seeds like you did. I like your way better, our cardboard supports didn’t like cooperationg, and this is faster. We’ll have to try it. I HAVE BEEN HOPING FOR DIRECTIONS FOR THIS. THANKS SO MUCH. Oh and I forgot you can put blueberry seeds in too. Playdough might hold the mold well! Next you should make my Lime Mojito Soap. I can elaborate in an email if you wish. Basically it’s Lime and Peppermint EO’s. A nice layer of white shea butter soap then a soft green clear layer with peppermint leaves in it. Smells divine and makes you wanna dance! You can do it in a loaf or half round loaf mold. Great job and cute idea for the layers and seeds! Adorable! Cannot wait to try this for Farmer’s Market! Little girls were drooling over my table last week and I need some kidsy type soaps! looks great Ann-Marie! i made something similar earlier this month, it was SO fun to make too:D I’m gonna try your added glycerin idea….perfect bendy soap- I like it! Wow! That is amazingly clever! And so cute! Oh my, this is just amazing, love it!! !